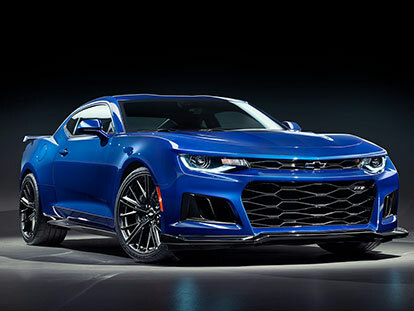 Re-engineered by HSV, the 2019 Camaro range represents muscle car mastery in its purest and most exhilarating form. Euphoric power, precision engineering, cutting-edge technology and a striking, iconic design combine to deliver a high-performance sports car range that pushes boundaries and gives new meaning to the word legendary. 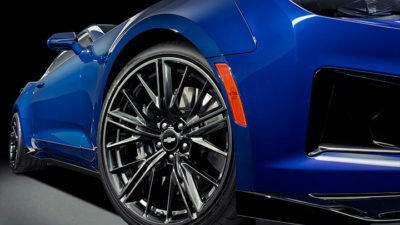 Every surface of the Camaro ZL1 is designed for maximum downforce. Massive upper and lower grille openings allow maximum cooling while aerodynamic enhancements like the unique bonnet, with carbon-fibre composite hood air extractor, and wing-style rear spoiler, help reduce lift and increase downforce to keep the Camaro ZL1 glued to the tarmac. The aggressive front splitter and rocker mouldings complete this sophisticated aero package. From the High Intensity Discharge headlamps at the front to the black-grained diffuser and vent at the rear, and the stunning 20”, 10-split-spoke forged alloy wheels in Dark Graphite, everything about this iconic machine takes high-performance to a higher level. 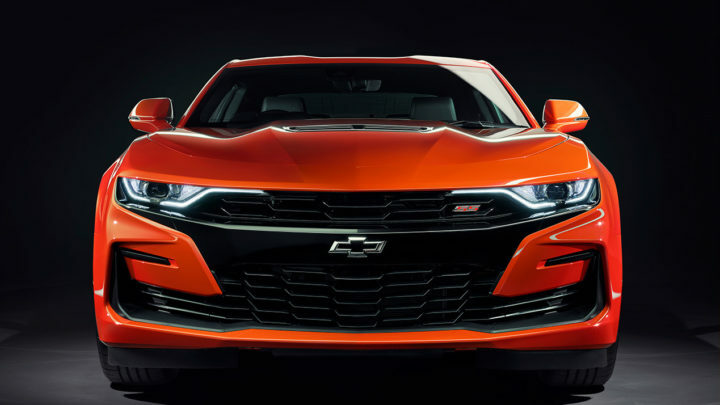 The 2019 Camaro 2SS is distinguished by its bold, new front-end appearance dominated by a revised fascia, blacked-out grille and newly shaped LED headlamps that include daytime running lamps. 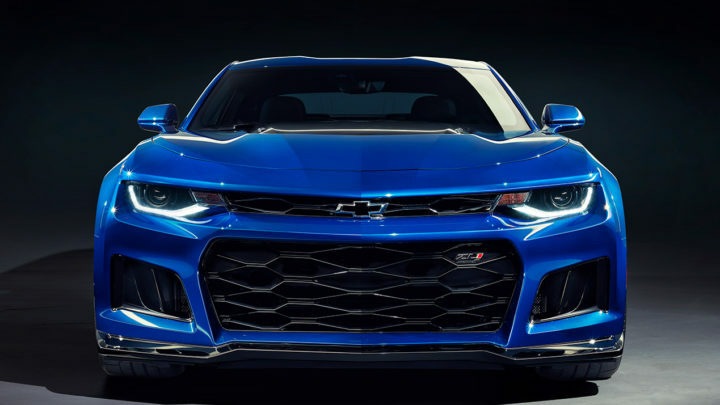 A stylish and functional air extractor is the centrepiece of the Camaro 2SS’ dome-shaped bonnet which pulls under-hood air from the engine compartment to assist with cooling and aerodynamics. 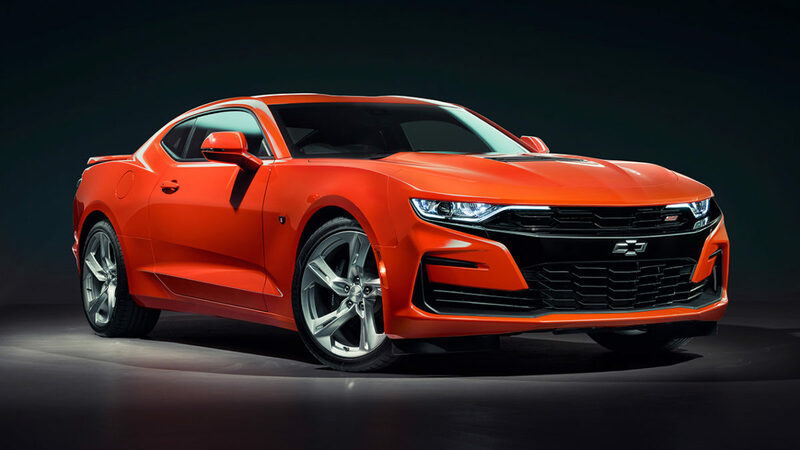 Helping the Camaro 2SS inhale even more air is the Chevrolet “flow-tie”; a hollow version of the iconic Chevrolet bow-tie emblem that allows air to pass through it, thereby helping reduce under-hood temperatures. At the rear, a new fascia with sculpted LED tail lamps delivers a chiselled appearance with new, 5-spoke 20” silver alloys completing an impressive exterior styling make-over. The premium interior of the 2019 Camaro delivers the perfect marriage of form and function with each touch designed to enrich your connection to the road. RECARO® front bucket performance seats with aggressive bolsters are the first sign that the ZL1 cockpit has been tailored for the track. 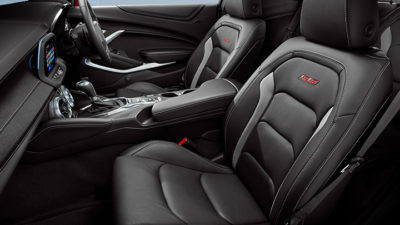 The seats are also heated, ventilated and power adjustable and feature Jet Black leather appointments, red accents and sueded microfibre inserts. Ideal for high-g cornering, the driver’s seat also features memory settings as it does on the 2SS. The 2SS features power-adjustable heated and ventilated Jet Black leather-trimmed front sports bucket seats delivering the optimum balance between comfort, support and style. 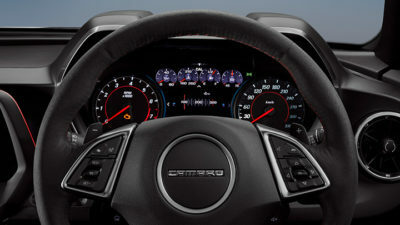 A flat-bottom, sports profile steering wheel, leather-wrapped on the Camaro 2SS and sueded microfibre on the Camaro ZL1, delivers ultimate grip and gives the driver more leg room, especially when quick heel/toe shifting is required. The gear-shifters in both models are similarly wrapped. 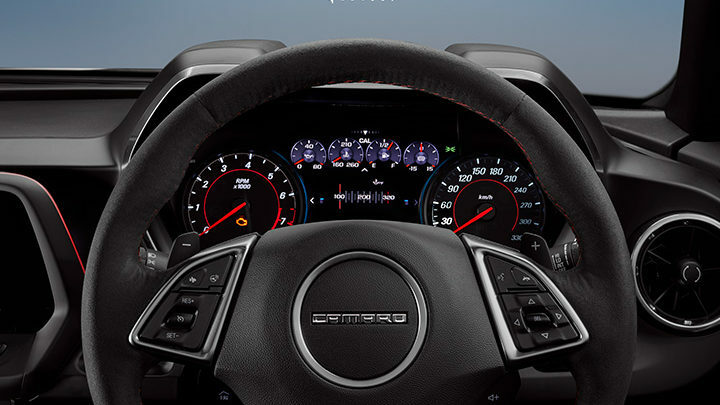 The Driver Information Centre in both models features an 8” configurable gauge cluster that allows you to monitor information such as lap-time, g-force cornering, fuel usage/range, tyre pressure and operating temperature. 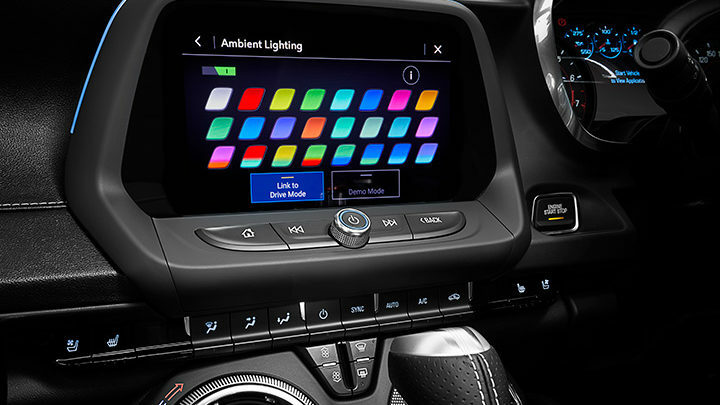 Dual zone automatic climate control, a 9-speaker BOSE premium audio and 24 colour Interior Spectrum Lighting, enhance the interior ambience of both models while wireless phone charging (for supported devices) is provided in the ZL1. Remote start, on the two automatic transmission variants, allows the vehicle’s engine to be started from outside the vehicle. When activated, the climate control system will also deploy the previous settings. New to the 2019 Camaro is Chevrolet’s next generation Infotainment 3 system expanding driver and passenger connectivity and including an 8” diagonal high-definition colour touch-screen, Apple CarPlay™ and Android Auto™ for compatible phones, voice-activated technology for radio and phone, Bluetooth® audio streaming for two users as well as the ability to create multiple user profiles. The power to blur fantasy and reality. 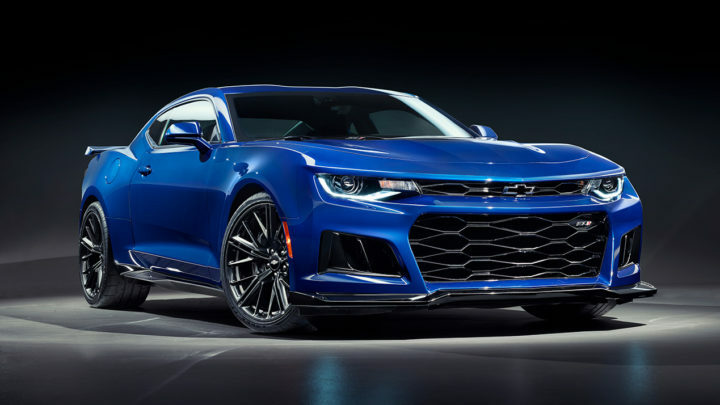 The ZL1 is the most powerful and sophisticated production Camaro ever built. 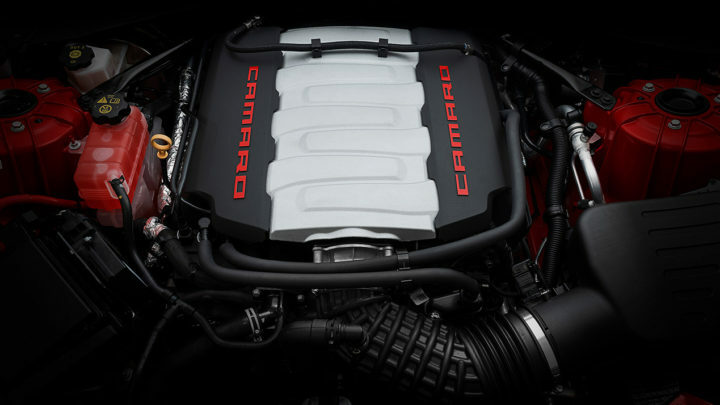 The Direct Injection, 6.2L LT4 supercharged V8 with Variable Valve Timing features an external heavy-duty oil to air cooler, and 11 heat exchangers, that help the engine generate peak performance. In addition, the engine’s supercharger is integrated into the intake manifold and fuel rail system for incredibly precise operation. 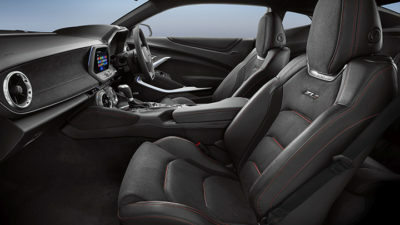 Gear changes on the ZL1 are equally precise thanks to your choice of a smooth-shifting 10-speed paddle-shift automatic transmission that features Custom Launch Control, Line-Lock and Lift-Foot Gear Hold, or a 6-speed manual transmission with Active Rev Matching which anticipates downshifts with throttle blips for smooth, precise shifting. While still subject to local certification, maximum power and torque in the vicinity of 480kW and 860Nm respectively is expected. 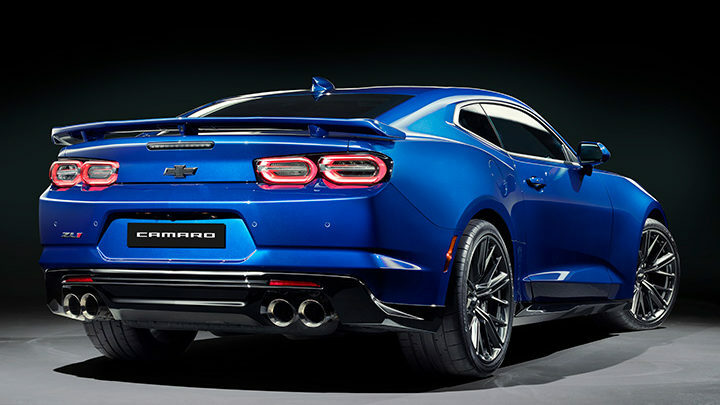 Under the bonnet of the new Camaro 2SS lurks Chevrolet’s 6.2L LT1 direction injection V8 with Variable Valve Timing and Active Fuel Management (AFM). 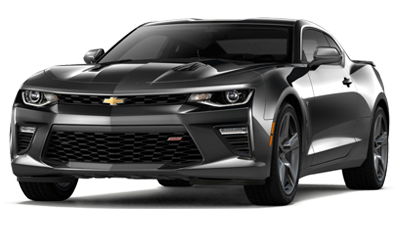 Like the ZL1, the 2SS features an external heavy-duty oil to air cooler which helps the engine generate peak performance efficiently. Press the start button and the roar from the quad-outlet, bi-modal performance exhaust lets you know you have up to an impressive 339kW of power and 617Nm of torque at your disposal. To make the most of all that power, the 2SS comes with the same transmissions as the ZL1. 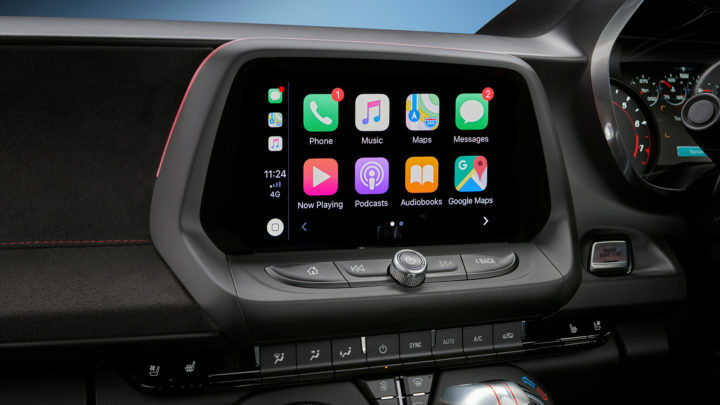 Drivers can opt for the 10-speed automatic transmission with paddle shifters, custom launch control and Line-Lock, or the short-throw, six-speed manual transmission with Active Rev Matching. 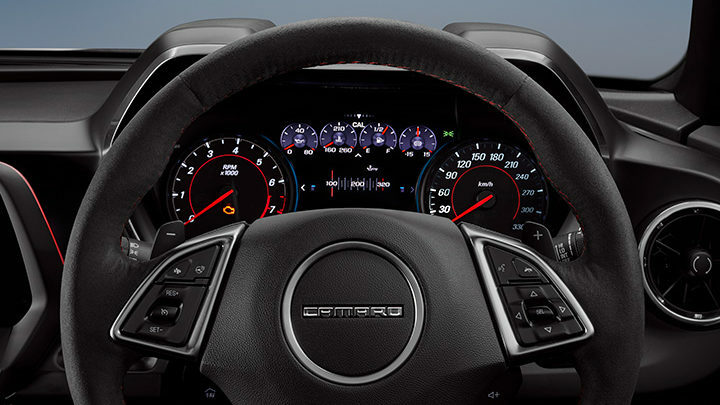 Completing the Camaro ZL1’s performance suspension is Magnetic Ride Control which reads the road conditions and monitors each wheel independently to change damping in just 10-15 milliseconds. Using shocks filled with magnetorheological fluid containing minute iron particles, the system continually adjusts vertical suspension to deliver greater body control, sharper handling and superior ride quality. Custom Launch Control modifies engine torque for optimised acceleration off the line. It allows you to adjust both the launch rpm and rear-wheel slippage, through the Driver Information Centre, to keep the rear tyres spinning at correct speed during launch. The Line-Lock feature lets you lock the front wheels to enable the rear wheels to spin (and heat), warming the tyres for maximum grip. (N.B. This feature is intended for use during closed-course track events only). The track-inspired Brembo brake package featured on the ZL1 boasts 6-piston monobloc front calipers and 390mm x 36mm two-piece front rotors for superior stopping performance and reduced fade. 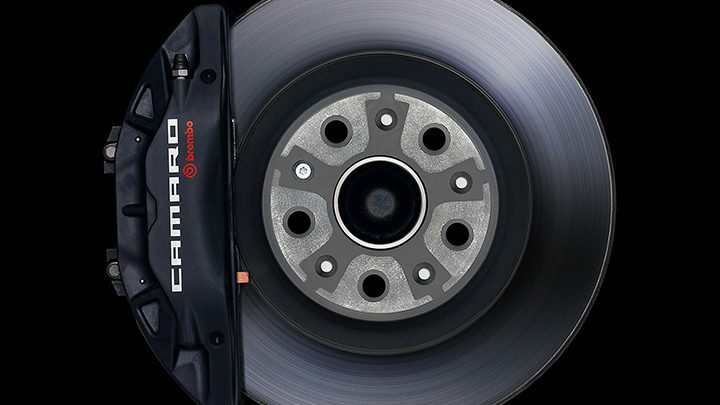 The Camaro 2SS features light-weight and track-tested 4-piston front and rear calipers, stiff for even pad wear, drag reduction and enhanced modulation. 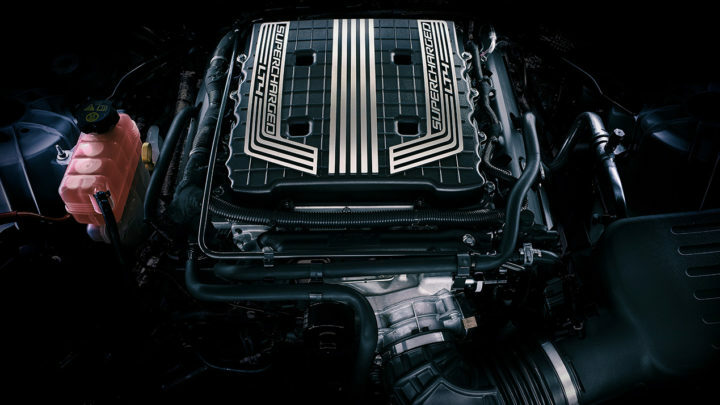 6.2L LT4 supercharged V8 with Direct Injection and Variable Valve Timing. 6-speed manual transmission with Active Rev Matching and Launch Control functionality or a 10-speed paddle-shift automatic transmission with Custom Launch Control, Line-Lock and Lift-Foot Gear Hold technology. Electronically controlled Limited Slip Differential. 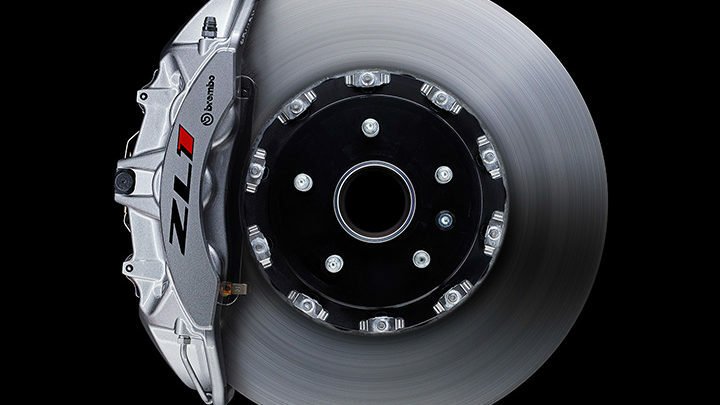 Brembo performance brakes with 6-piston monobloc front calipers and 390mm two-piece front rotors. 20” 10-split-spoke forged alloy wheel. Sueded microfibre-wrapped flat-bottom sports profile steering wheel and gear shifter. 6-speed manual transmission with Active Rev Matching and Launch Control. 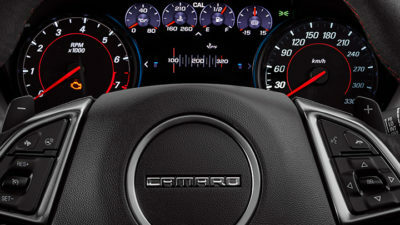 10-speed paddle-shift automatic transmission with Custom Launch Control, Line-Lock and Lift-Foot Gear Hold technology. New front-end styling including front fascia, grille, dual element LED head-lamps, functional extractor-style hood and “flow-tie” open bow-tie grille emblem. New rear fascia and LED tail-lamps. New 5-spoke 20” alloy wheels. 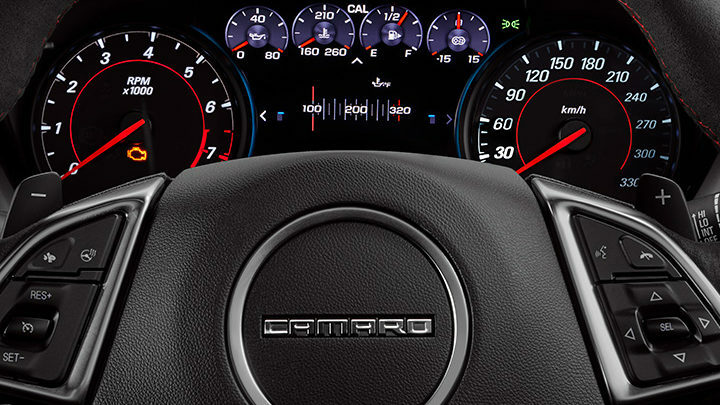 Next generation Chevrolet Infotainment 3 system.